Beyond the long arms of social media where we frequently address our complaints to organizations that have “done us wrong,” enters another new kid in town who stretches beyond the 140 character Twitter or the full time media Facebook guru, and claims it can connect you directly to the top decision makers. In the media age when companies know too well the firestorms that can be created from negative events and a failure to respond in a reasonable amount of time, perhaps Gripevine.com promises some good results. Just a month out into the public venue, the site Gripevine emerged offering dissatisfied customers the ability to “amplify their online voice.” Started by singer David Carroll of Nova Scotia, Carroll’s own negative experience with United Airlines made headlines when baggage handlers threw the singer’s band equipment and his own $3500 guitar haphazardly into the baggage compartment on the plane as Carroll watched helplessly from his airplane window. Despite all of his efforts to thwart the carelessness of the actions, nothing worked. When Carroll wrote a song entitled ‘United Breaks Guitars,’ it became a sensation. Obviously the negative publicity didn’t fare well for the airlines. Most organizations know not to argue on Facebook with customers. No matter what the problem, other sympathizers are sure to join into the conversation and before long the complaint turns into a fray. Nothing gets resolved, but chances are the organization already lost customers. Twitter complaints can also present a problem because an organization does not always know who the unhappy customer is; it is always better to directly contact the person and have a private conversation to solve problems rather than to let it grow via social media. Sometimes other people will arbitrarily join into the conversation – not always what a business needs to hear. Gripevine offers companies the opportunity to be automatically notified whenever someone has a complaint. Right now the most popular complaints center around phone companies and airlines, but Bank America and several debt resolution organizations have been solicited by consumers with unresolved issues. 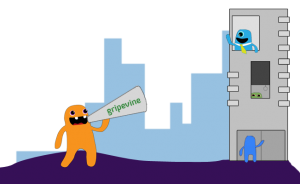 Gripevine.com encourages those who participate to rate a company on their customer service once a company responds, and that will be added to their own customer satisfaction index. A person wrote into Tampa General Hospital with a complaint about customer billing, and the hospital did respond asking the writer to contact them personally about the problem. Ironically United Airlines, despite several written gripes has not responded. Thanks for writing about us! Quick note, though – it’s Gripevine. Not Grapevine. Sorry about that Chris. All fixed! Nice post, I think the problem is that a larger a company or organisation is the slower they are to act on issues like this. Instead of letting the situation spiral out of control leading up to you feeling the need to write this post they could of managed the problem at its root. What I like about Gripevine is it allows both parties to address the issue. Instead of ranting to other social networking sites, here you can be heard.